myLot discussion 7.31.08 - do you think it's right to change for the "other"? its not bad to change something in you for others.. but i don't like that idea! what if that "other" will be gone one day in your life? will you go back to the old you since he/she is not at all with you? what if that "other" who is your reason for changing something in you will hurt you one day? will you still be that "new you" even if your very own reason for having the "new you" have caused you pain? i mean, its not a good idea for me to change for anybody else no matter how important that person is to you, so its better you change for yourself and not for anybody else! **its good to change for the better but i hope your reason changing something in you is not because of anybody else, you change for yourself, for your own good! myLot discussion 7.29.08 - does physical attraction always comes first before emotional connection? physical attraction usually happens fast even just at one glance to a person.. and looking for the emotional connection is not as easy though until you take the first step of having conversation with the person, usually finding something in common that both can relate! is that always the situation? physical attraction before emotional connection? or are there also instances where emotional connection is noticed or felt first before the physical stuff? what do you think? myLot discussion 7.29.08 - 50% cut in SMS charges -- an icing in the SONA? not at all a good news? i did not watch SONA yesterday but just now, i heard one of the announcements of President Arroyo in her SONA yesterday is the 50 percent cut in text messages fee! its one of her beautiful flowery words yesterday! many rejoiced with this announcement since almost all Filipinos are into mobile texting not to mention Philippines is considered the Text Messaging Capital of the World. But unfortunately, it was reported just now that the announcement made yesterday during the SONA regarding this matter mislead lots of Filipinos since actually it is only a promo that will last for 3 months! i just laughed and said what's new?! Filipinos are enjoying unlimited and all text promos of telecommunication companies years ago 'til now, why add such "icing" in her SONA?! are we playing jokes here?! how do you view it Filipinos? how i wish i could watch these concerts this upcoming months but that's just too impossible to happen since the concert venue is in manila, as always.. "davao na pud, one time lang! LoL! Panic at the Disco, previously known as Panic! at the Disco, will invade Manila as part of their world concert tour. its always been a question why they eliminated their famous "!" mark after the word "Panic".. well, see the difference now?! anyway PATD's sounds incorporate elements of pop, punk, big beat, electronica, dance, rock, psychedelic, folk and jazz. 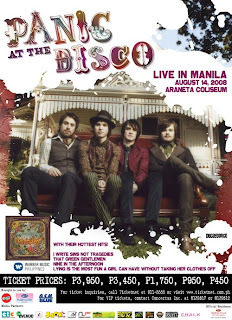 at present, they have already released two albums, their 2005 debut "A Fever You Can't Sweat Out" that has sold over 2.2 million copies, and their March 2008-released album, "Pretty Odd" which includes its big hit "Nine in the Aftrenoon" and of course my fave, "That Green Gentleman"! I just love their music! and of course, one of my all time fave, Avril Lavigne.. who would want to miss her concerts, right? but unfortunately, we're not all lucky enough, including me, to be able to watch and listen to her music live.. this September 3 will be her 2nd time to do concert in the Philippines, but this time, she's back with her "Avril Lavigne... The Best Damn Tour".. her very famous and a big hit "The Best Damn Thing" album has already sold more than 5 million copies dated the end of last year.. really cool! this canadian rock singer has really captivated a lot of people with her good music.. one or should i say some of my fave songs by her include "Complicated", "I'm With You", "My Happy Ending" and the recent "Girlfriend" and "When You're Gone"... really good music.. you can't help but sing along with her when her songs are being played in the radio or in the tv.. one of the best! before having a concert here in Pinas, she'll be doing series of concerts with the Jonas Brothers, my another "fave" song artists popular with their "When You Look Me in the Eye".. actually a petition for the JB to hold a concert in Manila is signed by a lot of Filipino JB supporters, but still no sure if approved or not.. well, they're also a big hit here so why not?! im doing myLot yesterday and was just surprise with this discussion created by myLot member, everlasting, under the "Philippines" category... upon reading this discussion, i just started to flame! LOL!! While Typhoon Frank devastated the country and claimed more than 650 lives, including the poor victims of the MV Princess of the Stars sea tragedy, illegitimate President Gloria Macapagal Arroyo and her 74 junketeers mindlessly spend billions of taxpayers' money to visit Bush and watch Pacquiao fight in the US. the government officials spent USD 1.5 million for their trip to US to visit Bush and to watch the the fight of Pacquiao... isn't it stupid?! we're in calamity these days -- poverty, continued increase of rice and gas price, not to mention the victims of the of typhoon Frank and the recent sea tragedy! such a waste of money! while those 74 government officials enjoyed watching that boxing fight, a lot of Filipino people are standing for so long under the heat of the sun just to avail the limited supply of NFA rice... what a shame?! such a bullnuts! come to think of it, they're spending the money of the people to satisfy their recreational needs?! sorry to use this term but you all are nothing but STUPID ID**TS! i bet you also receive this kind email guys! magmigrate na lang lagi ko! haha..
nothing important to post but i want to post! my adrenaline's so high! i'm so excited! can't wait 'till that day comes! time runs so slow, my God! how many more days i have to wait?! can't sleep, my insomnia's attacking me again thinking about that thingy! hahaha..
out of idleness, i come up with this video -- a compilation of photos taken during the college life of clan B, including me.. it feels good to reminisce all those days! thanks for the memories! char! check this out in youtube too! hehe..
i had a simple conversation with mama and papa the other day, it was a very ordinary chit chat that eventually led them asking me, what are my plans for myself. am i contented staying at home doing nothing?! well, i jokingly answered them back, i only want to work outside davao, probably manila or cebu! haha.. it was a joke, but jokes are half meant or in my case, 75% meant! lol!! actually early this june i already made my attempt to ask them if i can work outside davao, but as expected, they refuse giving such lame reasons! well, i understand, i know there's a deeper reason why they won't allow me, the reasons they gave me were just excuses! i can read between the lines ma! im not that slow-minded! haha.. touch naman ako! by the way, admittedly, i reach the point of this some kinda "eagerness" to be independent that's why i want to work outside davao.. i really am eager and willing to start a new life by myself, i want to become independent and i know i need to! i want to get out of my comfort zone and i always think staying here in davao won't give me that chance! i want to know how far can i go and how long can i stand by myself! you may think i exaggerated the term "independent-living" but that's what i really want! but since my attempts of asking permission all failed, i didn't apply for any job here in davao even though a lot of chances and opportunities are knocking, i ignore it all! those text messages, phone calls, job offered/introduced by some relatives and family friends -- i ignore it all!! that's how i indirectly rebelled! lol! anyway enough for that thing, im over it, and im back with my clear mind! what's funny now is i still don't have any plan to look for a job even if i already accepted the fact of me staying forever here in this &?#@ city! you know what?! i want to study social issues, don't know what the course is but something about social works and learn all societal issues including poverty, ethical and legal issues concerning our community nowadays.. i have the heart and mind to study it again.. and so i jokingly asked mama if i could take that course, as expected, she laughed then asked me where did i get that idea, that funny idea! she thought im joking.. well yeah, im joking but then again 75% meant! hahaha.. i dont know what now, i dont know what's next in this boring life of mine! but another thing, i reflected on this and really made time to think it over for 3 days and nights i guess, i am actually asking myself, what i really want since my entire life, i really don't have any direction, im a very confused person, promise! well, anyway, so far as my mind works this way, i realized this thing, actually i didn't wish to have a job though i'm aware i dont have money, i'm not rich and so i need to work to earn but i dont know, i just dont feel like working, it never seriously slipped in my mind.. what's all in my mind now is i want to make changes in my life through helping those in need.. how i wish i could touch everyone's life in a positive way and leave a footprint on society before my life will fade away.. i was really inspired by Albert Einstein's words: try not to wish to become a man of success but rather wish to become a man of value in the society.. i may sound funny but its true! im not dreaming too much of success and money, all i know is there are people in need.. im starting not to think of myself but rather think of the people who needs more than i do! having live my life comfortably as the way i do is already a great blessing! don't you think a funny clown is talking now?! haha..
hahai.. i dont know if i should laugh at myself thinking this way, but God, that's just how simple my mind works and that's what i want.. do i need somebody to knock my head off and be awake of the reality and realize how important job and money are?! if so, just tell me, i'll stand in front of you so you can knock my poor head off!!
" things are shaping up to be pretty odd!" That Green Gentleman by Panic! At The Disco..
and this is just one of my fave from P! ATD..
still number one in my playlist..
la pa ngsawa! love it! things have changed for me, and that's okay?"